The police have arrested top Jamaat-e-Islami leaders Matiur Rahman Nizami, Ali Ahsan Mohammad Mojaheed and Delwar Hossain Sayedee on charges of defying court orders. They were detained in a case filed for hurting religious sentiments after a Dhaka court earlier in the day ordered arrest of four party leaders. Chief of the fundamentalist Jamaat, Nizami was arrested at the National Press Club around 5:15pm on Tuesday, Dhaka deputy police commissioner Krishnapada Roy confirmed bdnews24.com. He said former agriculture minister Nizami was taken into police custody following a court order. Secretary general Mojaheed was arrested in front of the National Memorial at Savar around 4:30pm, Ashulia police chief Sirajul Islam told bdnews24.com. The ex-social affairs minister was on his way to village home at Shabashpur in Faridpur with his wife Tamanna Jahan and son Ahmed Takik. Ashulia police handed him over to the Detective Branch at around 6pm. Jamaat supporters at Ashulia protested when he was taken to the police van. The police detained one 'Sohel'. Executive committee member Sayedee was detained from his Shahinbagh residence around 5:30pm, a Detective Branch official told bdnews24.com. Officer-in-charge of Paltan Police Station Shahidul Huq at 6pm told bdnews24.com: "The police also raided the city Jamaat office to detain city Jamaat chief Rafiqul Islam Khan on reports that he was there. But we did not find him there." Khan is also facing arrest warrant, he added. Ramna police have taken position in front of the Jamaat headquarters at Maghbazar from 5pm to thwart any unpleasant situation, officer-in-charge Shibly Nomani told bdnews24.com. Magistrate Mehdi Hasan Talukder of Dhaka Chief Metropolitan Magistrate's Court issued the order against the four as they did not appear before the judge. The court granted bail to another suspect in the case, Mohammad Yahia, Islami Chhatra Shibir president of Dhaka metropolitan (south), after he had surrendered to the court and sought bail. The court set August 3 for next proceedings, defence counsel Muhammad Abdur Razzak said. 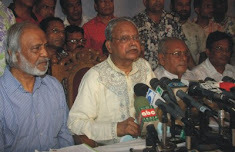 The case cited Rafiqul Islam Khan's comparison of Nizami to Prophet Muhammad at a March 17 meeting of the pro-Jamaat student front Islami Chhatra Shibir in the city. Various newspapers on Mar 18 reported Khan as saying that the prophet in his lifetime was "tortured, falsified and conspired against" and "the same is happening in the case of Nizami". Khan later denied the reports. 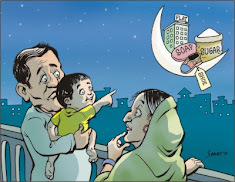 Bangladesh Tariqat Federation secretary general Syed Rezaul Haque Chandpuri filed the case on Mar 21. They were initially summoned to appear before the court on Apr 28 but they did not show up. Thy court issued another summons that day but this was also disobeyed.